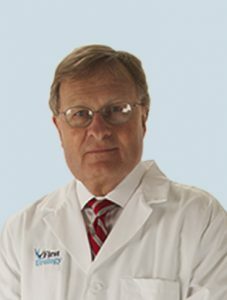 CHARLOTTE, N.C., March 27, 2018 — HIFU Prostate Services, LLC, the leading provider of HIFU technology to physician practices in the United States, announced today that they have partnered with Baptist Health Louisville to offer HIFU (high intensity focused ultrasound) for prostate cancer at their state-of-the-art hospital in Louisville, Kentucky. “At Baptist Health, we pride ourselves on providing exceptional patient care while exceeding our patient’s expectations for quality and satisfaction. We are excited to partner with HIFU Prostate Services to provide prostate cancer patients minimally-invasive options in our patient-centered facility,” said Donna Triplett, director of surgical services, Baptist Health Louisville. Brooks Jackson, MD, a urologist at First Urology, treated the first prostate cancer patients with HIFU last week at Baptist Health Louisville. These patients will be able to have a portion of the cost of their HIFU treatment reimbursed since last year a Medicare code was issued by the Centers for Medicare and Medicaid Services. HIFU uses ultrasound energy that is focused to a specific spot to rapidly heat and destroy tissue in the prostate. Unlike radiation, ultrasound energy is clean and will not cause damage to areas around the prostate that are not targeted. This greatly reduces the risk of side effects such as urinary incontinence and erectile dysfunction. “We have a wonderful relationship with Baptist Health and look forward to helping seamlessly integrate HIFU into their system to offer men the non-invasive treatment option,” said Michael Shannon, chief executive officer, First Urology. HIFU may be recommended by a doctor as a first line of treatment or it may be used to treat patients that have failed radiation therapy and had a localized recurrence. Additionally, it does not preclude any future treatments including surgery or radiation. HIFU offers patients an outpatient treatment that is bloodless and allows patients to return to their normal lifestyles within a few days after treatment. “We are excited that HIFU is now available at Baptist Health Louisville, offering prostate cancer patients in the greater Louisville area another treatment facility,” said John McLean, chief operating officer, HIFU Prostate Services. HIFU Prostate Services was founded to provide men access to a less invasive treatment option for prostate cancer that has the ability to eliminate cancer and preserve patient quality of life. Our mission is to deliver the highest quality of care, support, and technology to the patient and to the urology community for the treatment of localized prostate cancer using Sonablate® HIFU. The company is headquartered in Charlotte, NC and with locations in 14 cities throughout the US. Learn more at www.hifuprostateservices.com. Formerly known as Baptist Hospital East, Baptist Health Louisville is a 519-bed hospital offering a wide range of healthcare services. Area residents benefit from the hospital’s emergency services, including special teams for heart attack and stroke care. The hospital’s cancer services include two freestanding Radiation Centers, the Charles and Mimi Osborn Cancer Center that includes a cancer resource center and a multidisciplinary lung care clinic. Special services include women’s health, offering all-private rooms, digital mammography, ultrasound and bone-density scanning for osteoporosis. Other areas of expertise include orthopedics, neurosurgery, cardiovascular services, wound care, behavioral health, occupational health, and in-home care provided by Baptist Health Home Care. Baptist Health has a network of healthcare providers for patients in the Metro Louisville area – from Baptist Health Medical Group physician offices, to Baptist Health Urgent Care and Baptist Health Express Care inside Walmart stores and Baptist Health Occupational Medicine (formerly known as BaptistWorx®). The hospital has twice achieved Magnet designation for excellence in nursing services by the American Nurses Credentialing Center’s (ANCC) Magnet Recognition Program®.